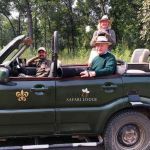 If ever there is an argument for visiting a wildlife park and never leaving your hotel then Samode Safari Lodge has to be it! 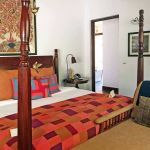 It’s not often that we’re taken aback on entering an hotel room but at Samode Safari Lodge on the edge of Bandhavgarh National Park in India we experience a definite double-take! 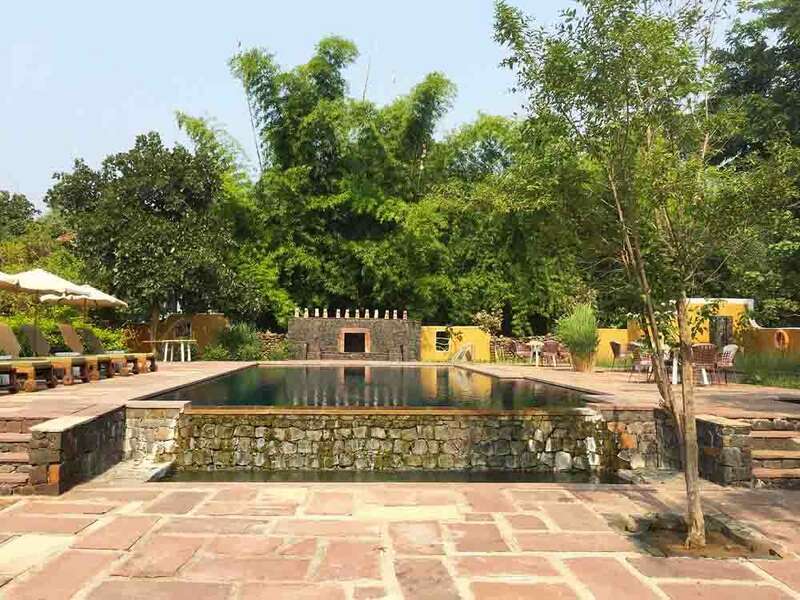 We should have expected a treat as Samode’s other hotels (beautiful heritage properties in Rajasthan) had, on previously visits to India surpassed expectations but the unremarkable entrance to the Samode Safari Lodge completely downplays the experience ahead of you. 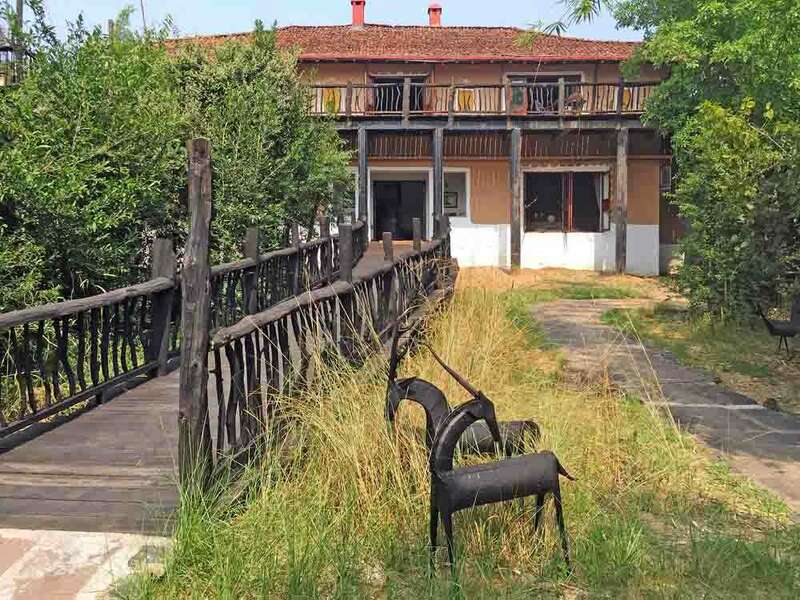 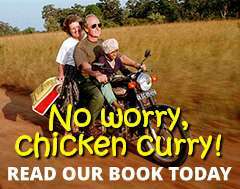 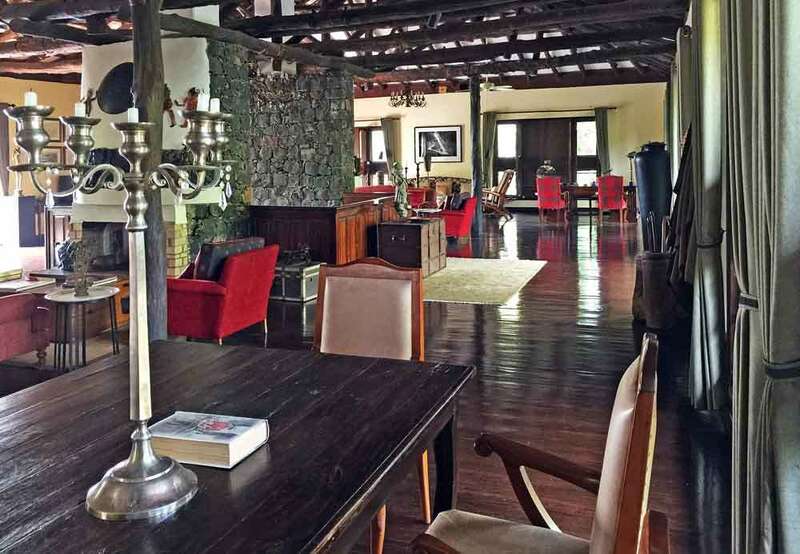 The Lodge lies at the end of a dirt track, through iron gates and another winding track, to a turning circle where the group of welcoming staff distract your attention from the clumsy entrance access. 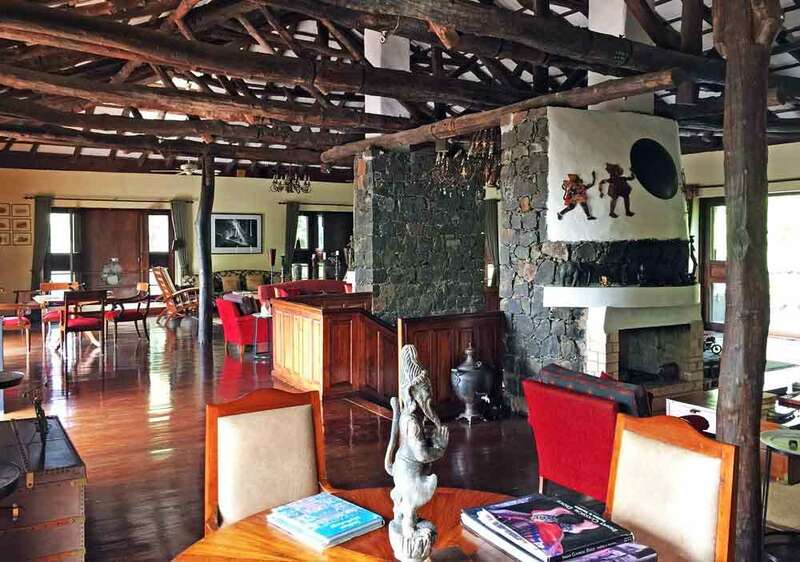 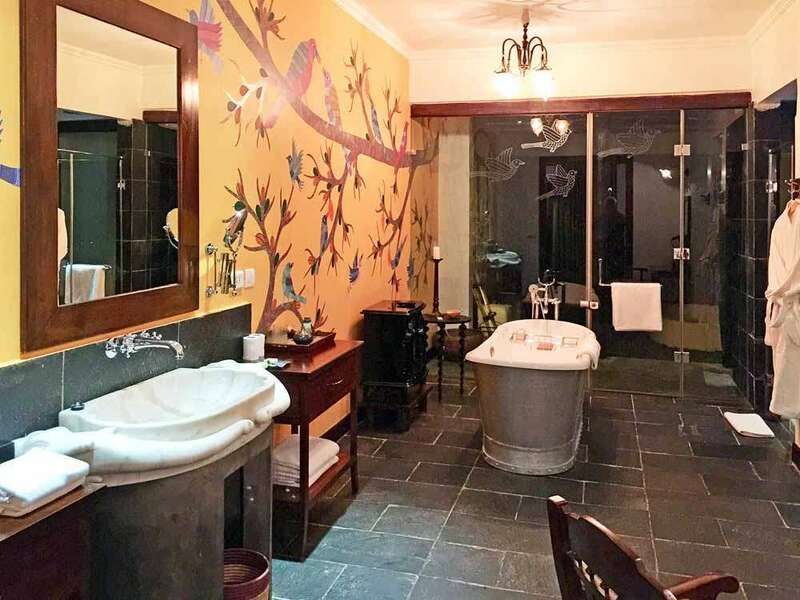 This is the one and only time you’ll be wrong-footed at Samode, as the staircase from the ground floor leads to a substantial and sumptuous lounge and reception area that’s reminiscent of luxury African safari lodges. 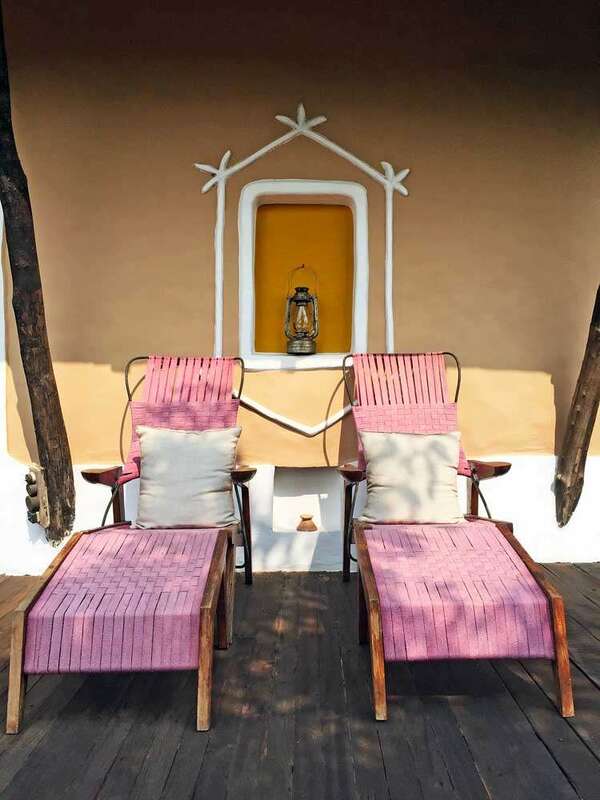 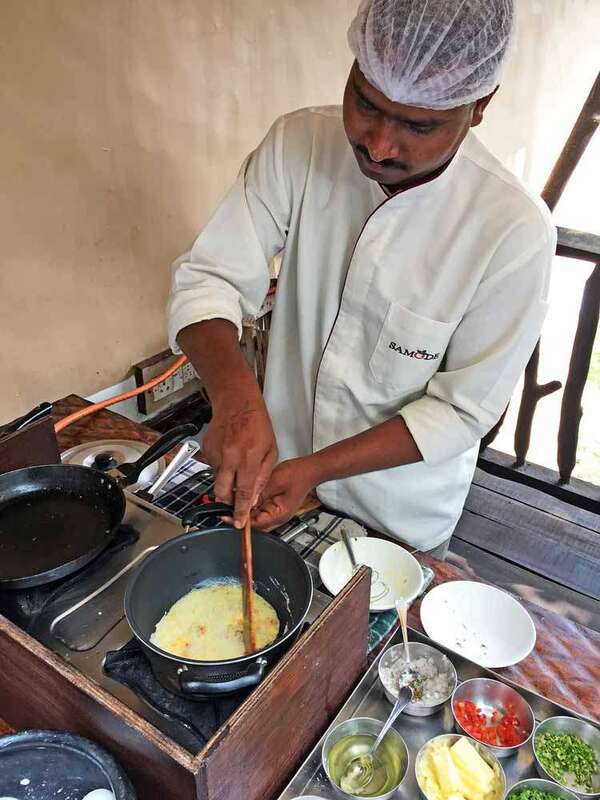 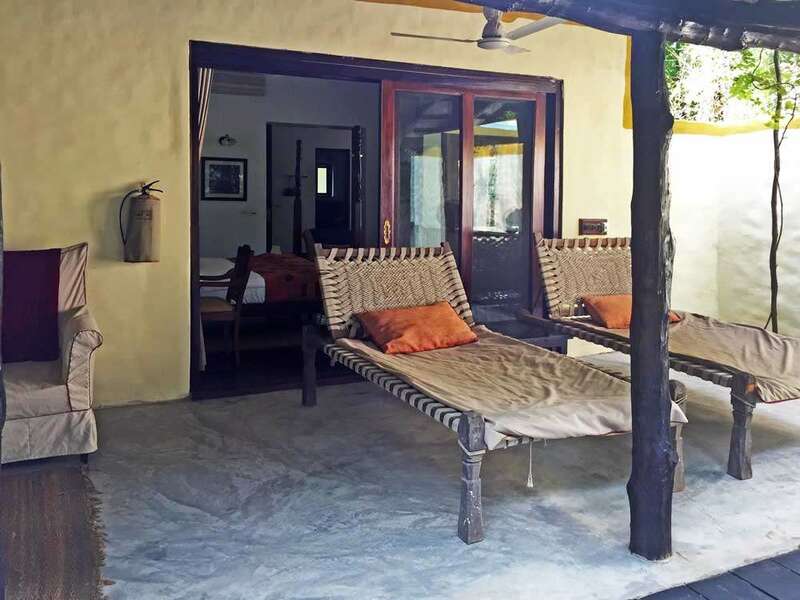 In fact, the whole layout of Samode turns inward facing, in that far more concentration has been applied to what’s inside the lodge by way of service, dining, care and attention to detail than has been to initial outward appearance. 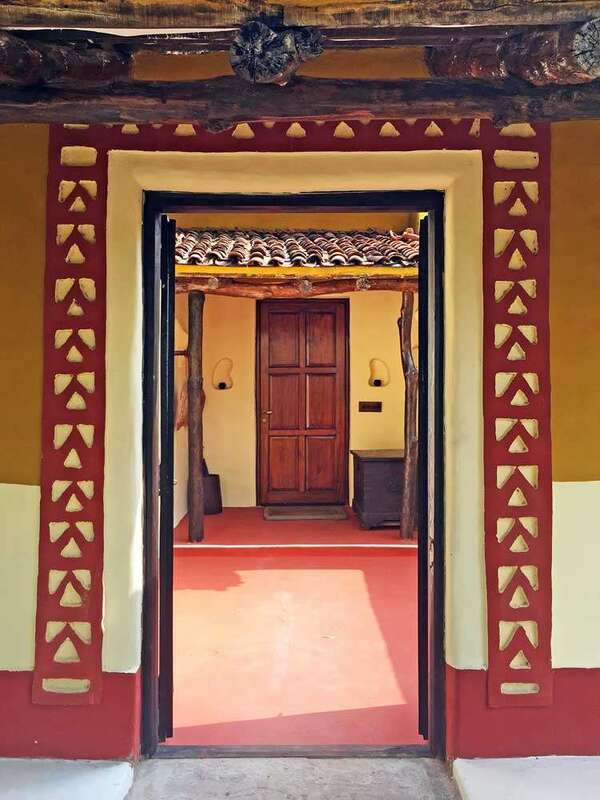 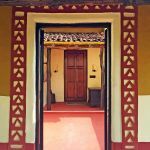 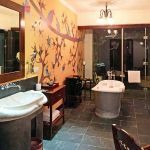 We’re shown to our room, which is more akin to a luxury villa and we’re overwhelmed by the almost Tardis-like transformation from what appears to be a mud hut on the outside into a plush, spacious and eminently comfortable collection of spaces on the inside. 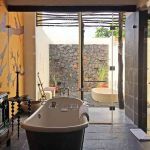 We’re shown through the lounge of our villa with its adjacent guest washroom, through double sliding doors to the bedroom with its capacious bed and glass doors that lead out to the veranda with a verdant jungle aspect. 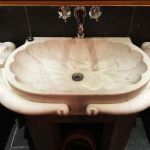 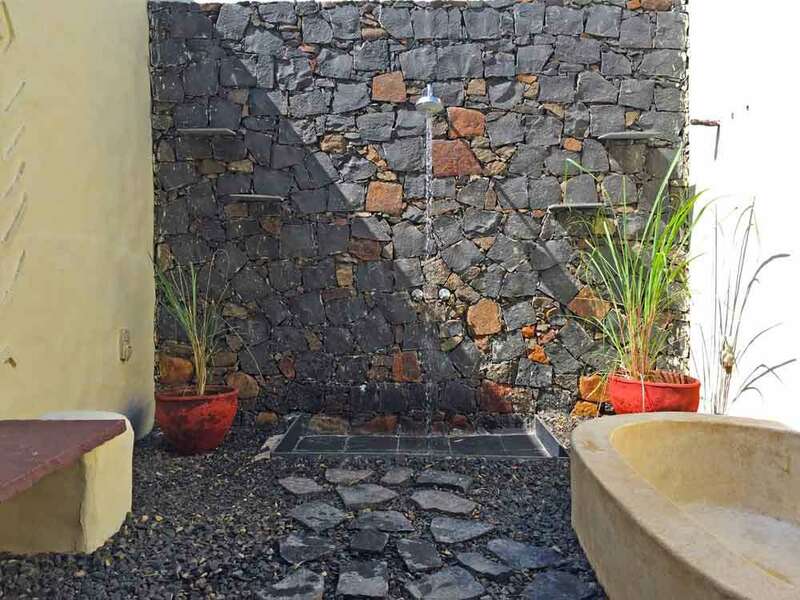 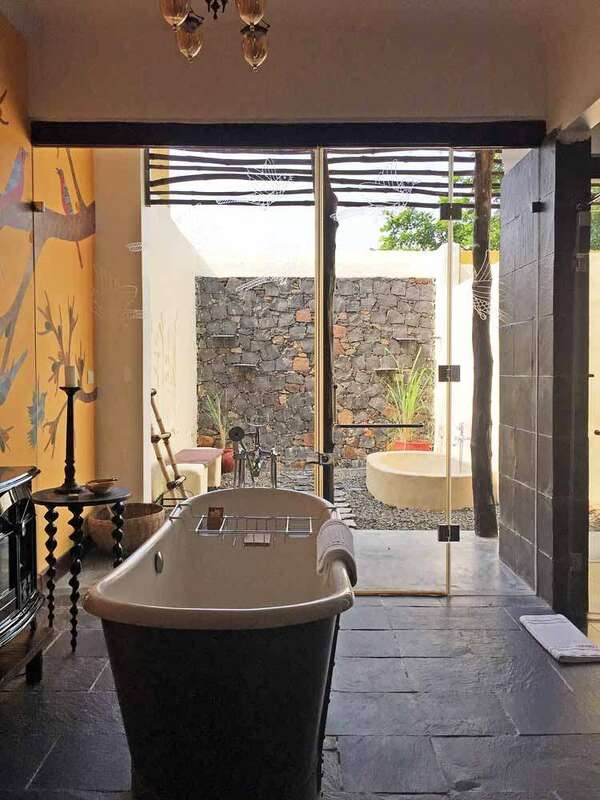 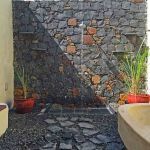 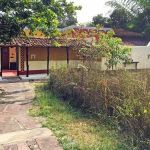 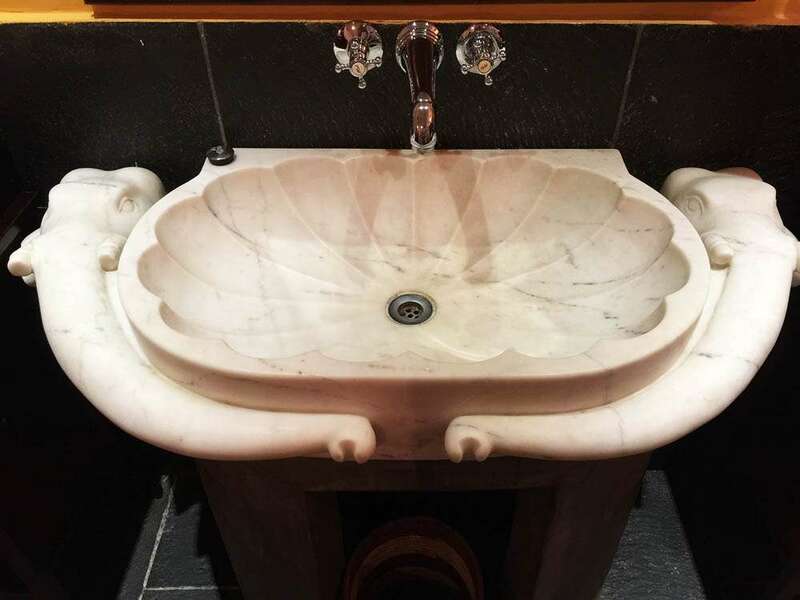 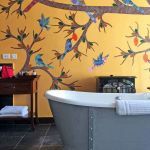 Our cases are taken for us through to our dressing room that adjoins the enormous bathroom with its full-size bathtub, double internal shower, toilet and external courtyard with shower and bathing area. 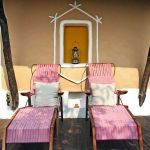 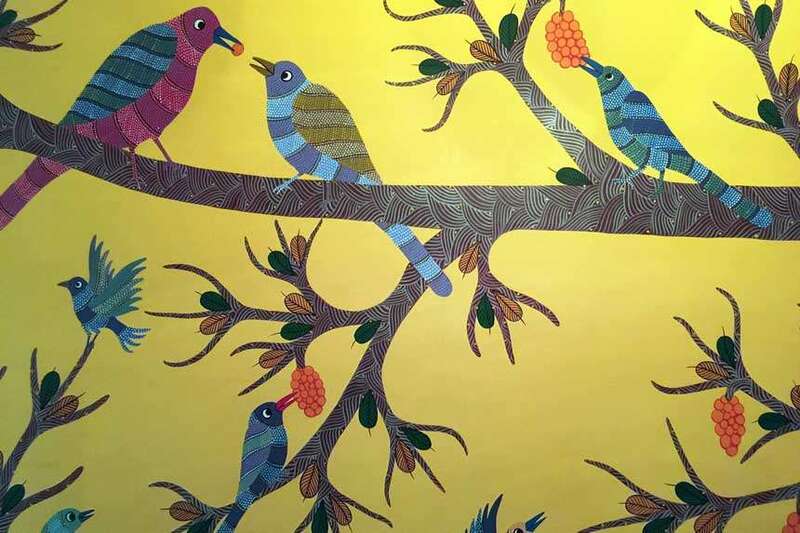 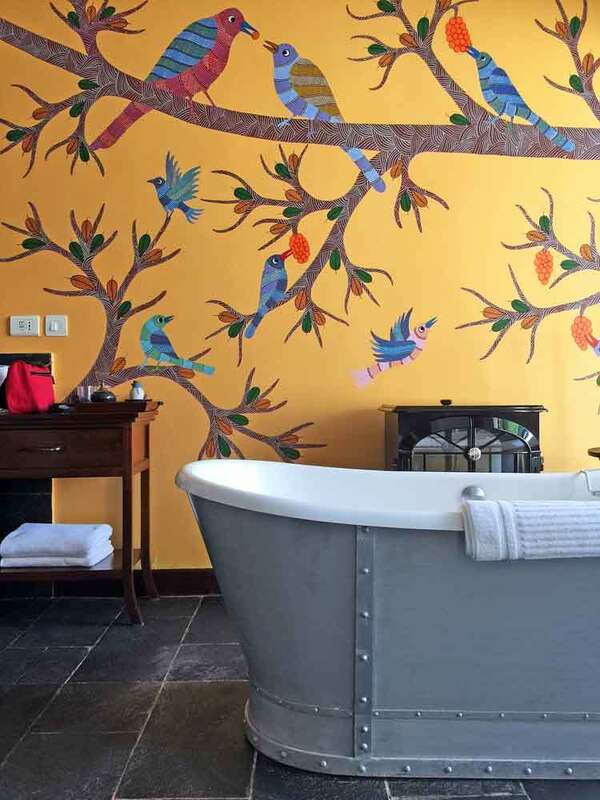 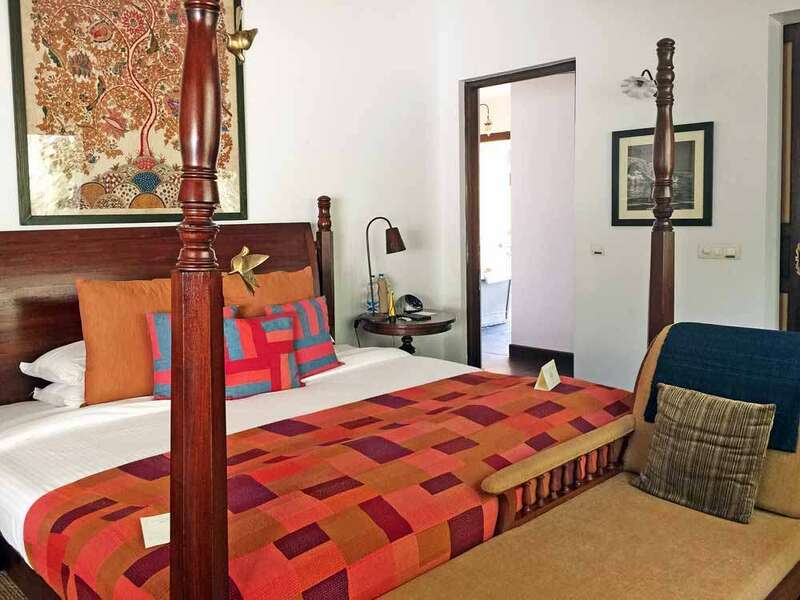 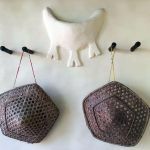 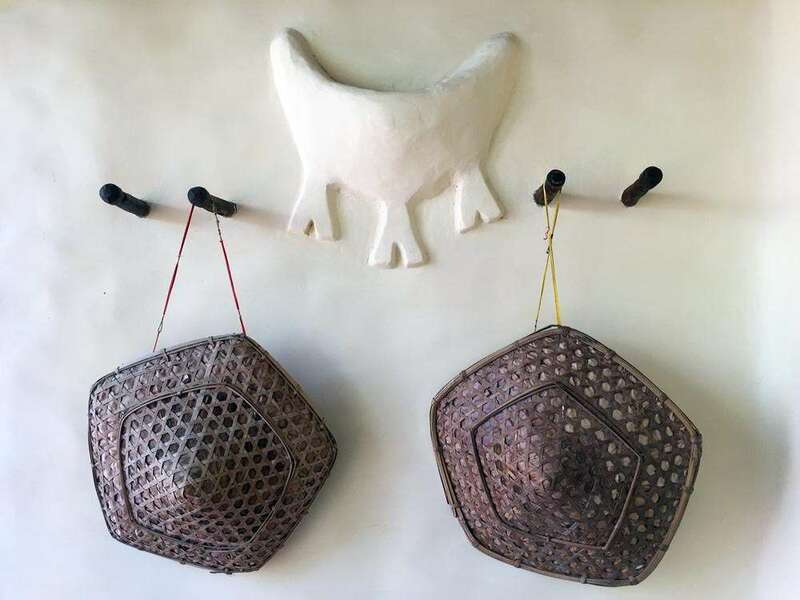 Colourful Gond tribal paintings adorn the walls and numerous small touches underline the fact that no aspect has been compromised to make our apartment feel just like home – down to the fresh lime awaiting our choice of drinks on the lounge sideboard. 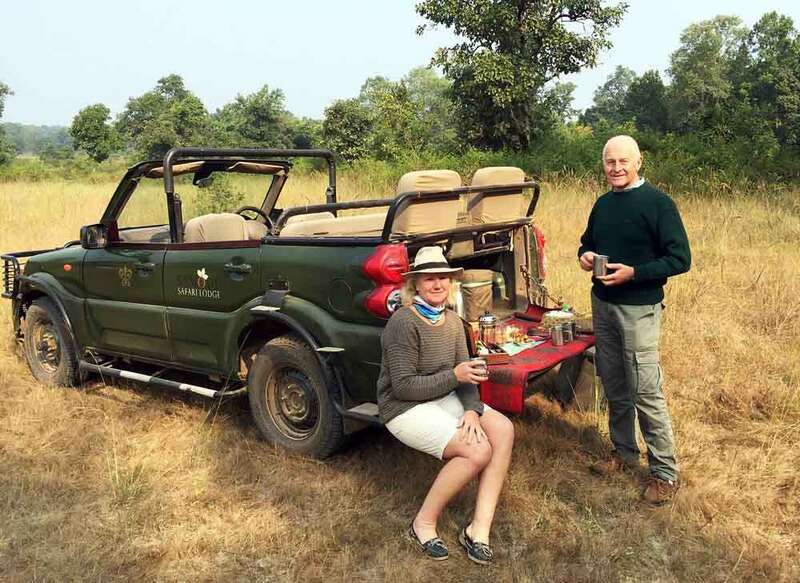 Indian wildlife safaris dictate that you’re always up before the lark in darkness, barely get time to regroup after the morning fray before you’re back in a jeep for the evening round and then back after dark again – barely time to enjoy the place you’ve based yourself. 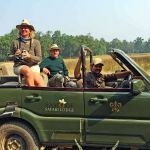 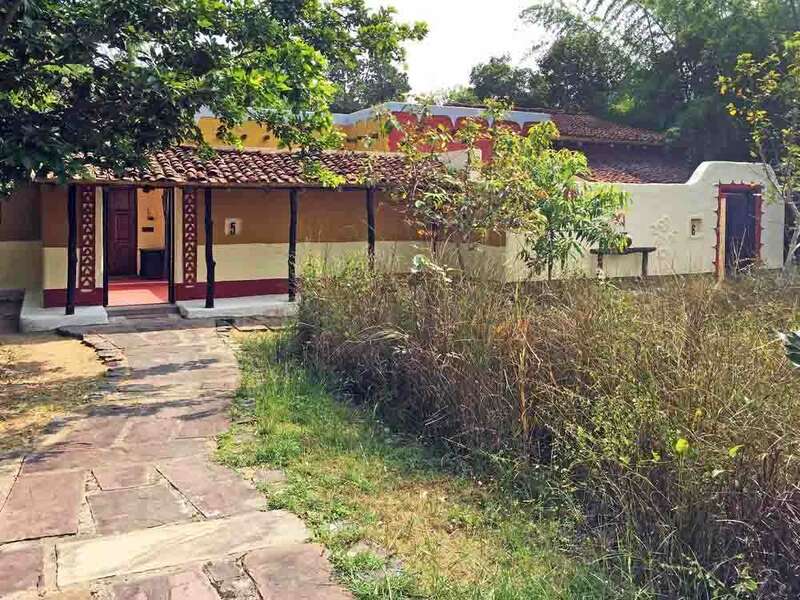 Fortunately, Indian parks currently close on a Wednesday afternoon, so it’s well worth timing your visit to Bandhavgarh specifically to coincide with this, in order to capitalise on Samode’s facilities. 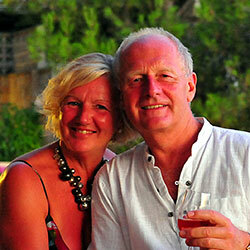 In fact, on reflection we think that we’d factor in another day or two just to stay in the grounds of the Lodge. 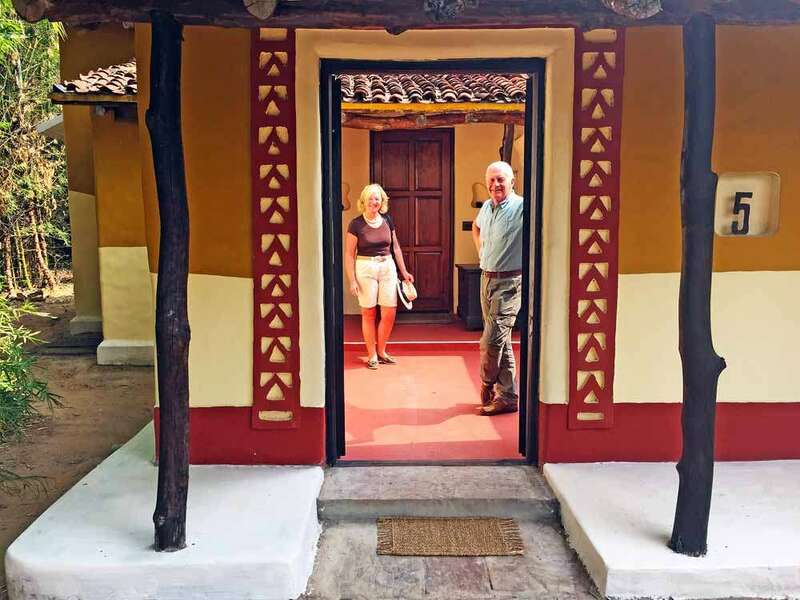 Returning to the main building, once we’d torn ourselves away from our lovely villa, it’s now that we appreciate the ‘back-to-front’ nature of the lodge. 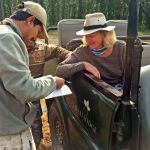 We pass the nicely sized swimming pool and skirt the external sitting areas that will be used for al fresco dining and re-enter the main lodge. 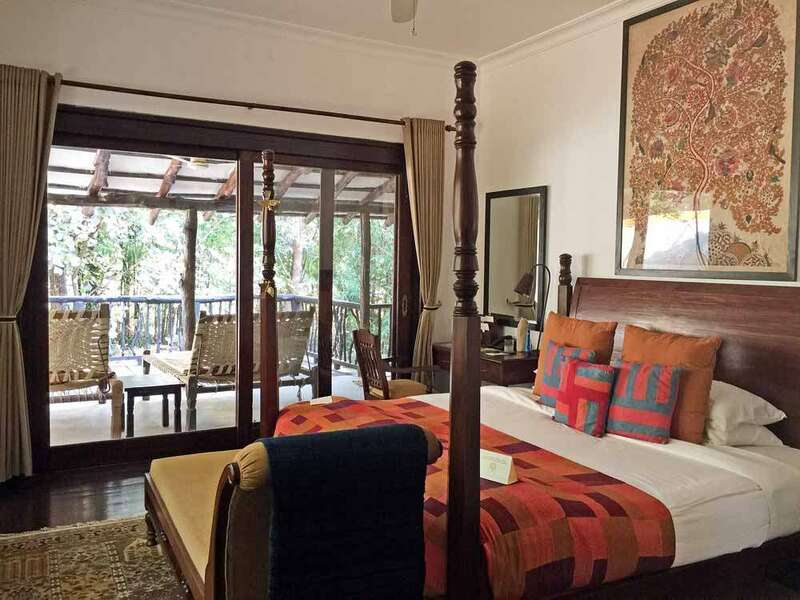 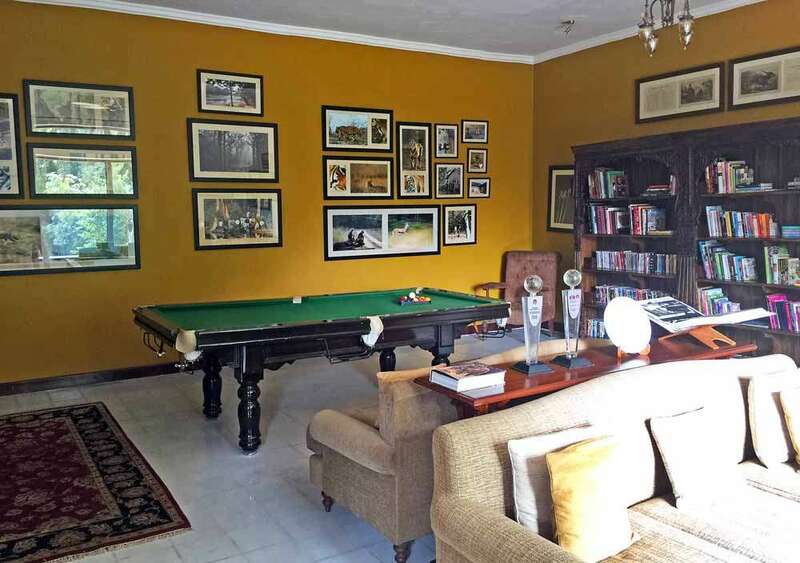 On the ground floor are a library with billiards table and a separate ‘orientation room’ full of maps and information to help you assimilate Bandhavgarh before you venture into it; rather than simply bumping around the park with little orientation. 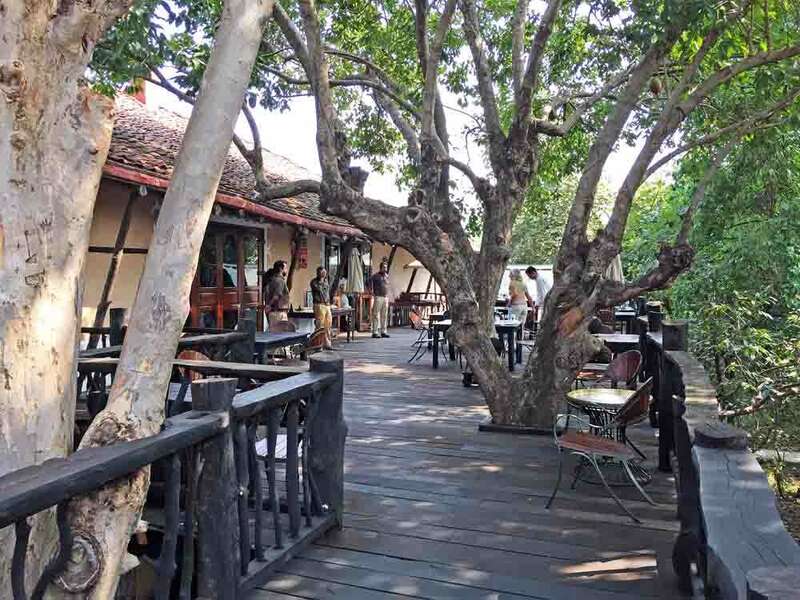 The lounge, upstairs, leads through the bar to an elevated wooden platform that overlooks the forest and links the two dining areas, one amongst the trees, the other a more conventional covered space. 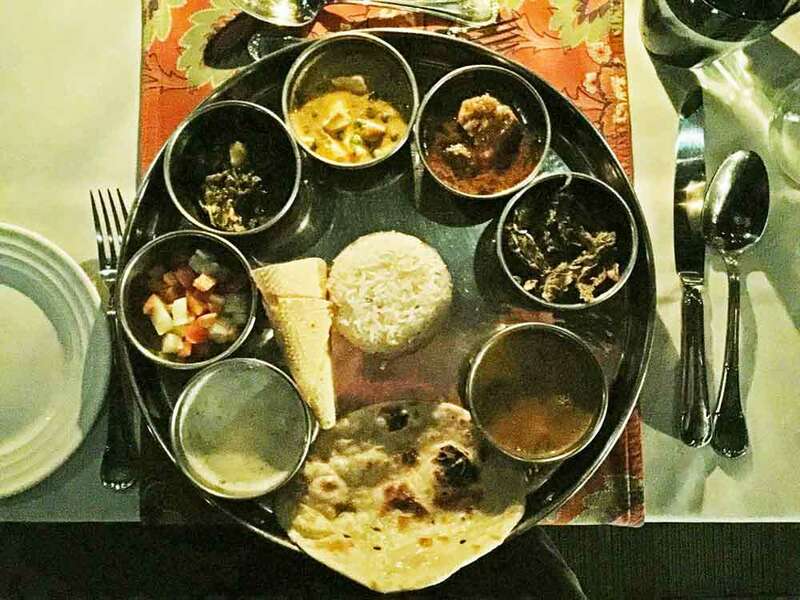 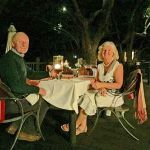 Dining is an event in itself and particularly welcome is the flexible timing of when you choose to eat – so there’s no regimented discipline that you can’t adjust to your own preferences. 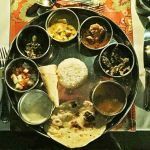 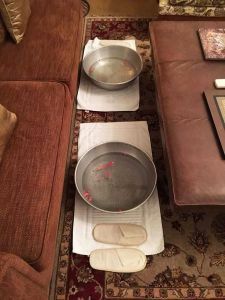 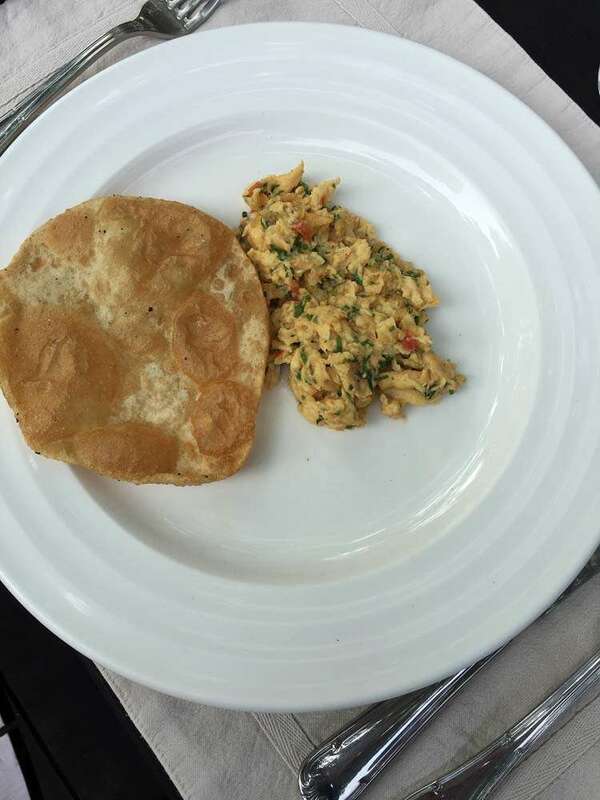 The venue for each night varies around the property but the standard, quality and presentation of what you consume never does. 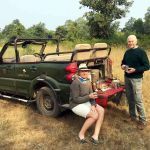 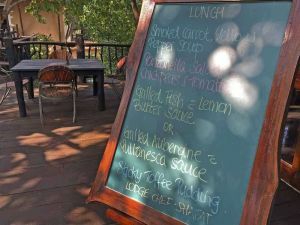 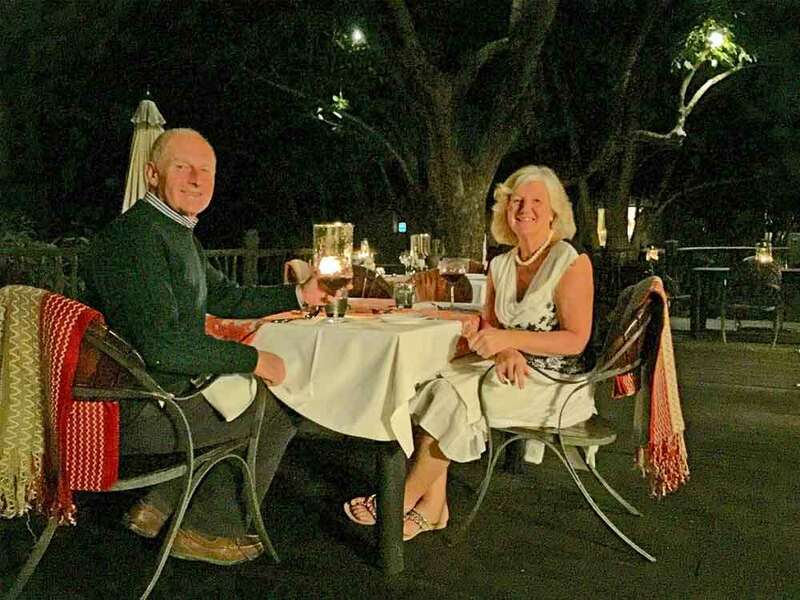 Samode operates on a ’jungle plan’ basis, which in short means that you’ll enjoy virtually all aspects of your stay – from safari to supping wine without a bill at the end, as its all pre-paid within the initial tariff. 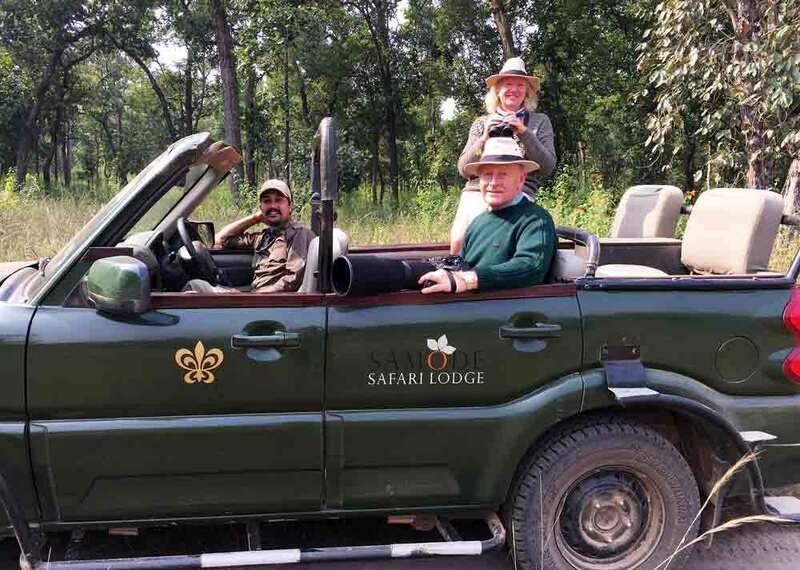 The villas are carefully spaced away from the main lodge in the lightly wooded grounds, which are extensive and worthy of their own nature walk with one of the lodge’s guides. 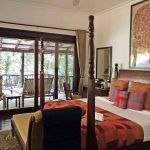 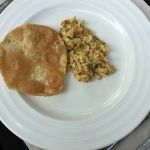 We only stayed at Samode Safari Lodge for two nights and could have easily doubled that, so reluctant were we to leave. 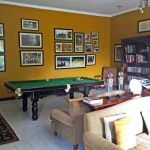 We didn’t get to dine in all of the locations around the grounds; we didn’t get to use the outside shower/bath ‘court’; nor the spa or to sink into the inviting sofas in the lounge to read or enjoy an aperitif; we didn’t get to play billiards or explore the afforested areas around the lodge – in fact, we barely spent enough time to convince ourselves that we’d love to come back again…and again…and again! 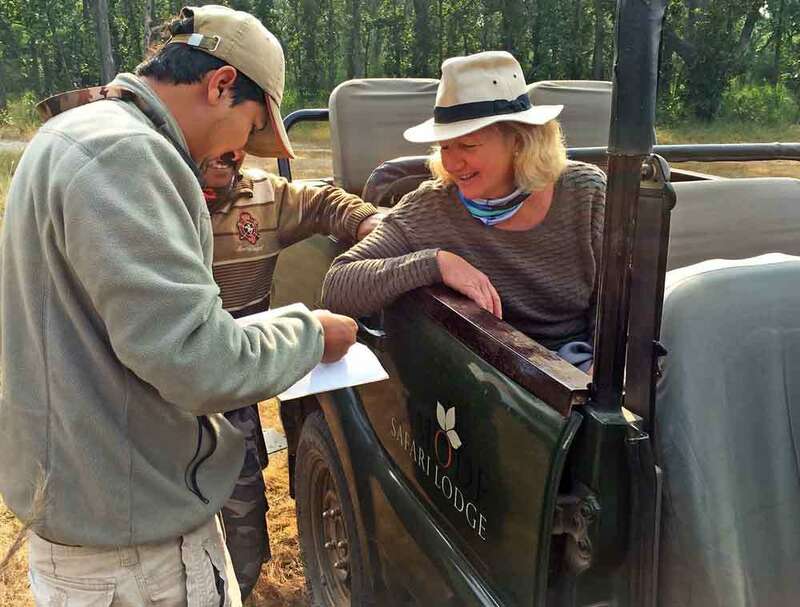 This is no small part to the lodge principal Anshuman Shah and his wife Priyam who go out of their way to make your stay special and never lose sight of the fact that theirs and the lodge’s existence currently relies on the conservation of the forest and its inhabitants – even though we’d visit again and perhaps forego the park on occasion; although we would miss the heated foot baths awaiting our return. 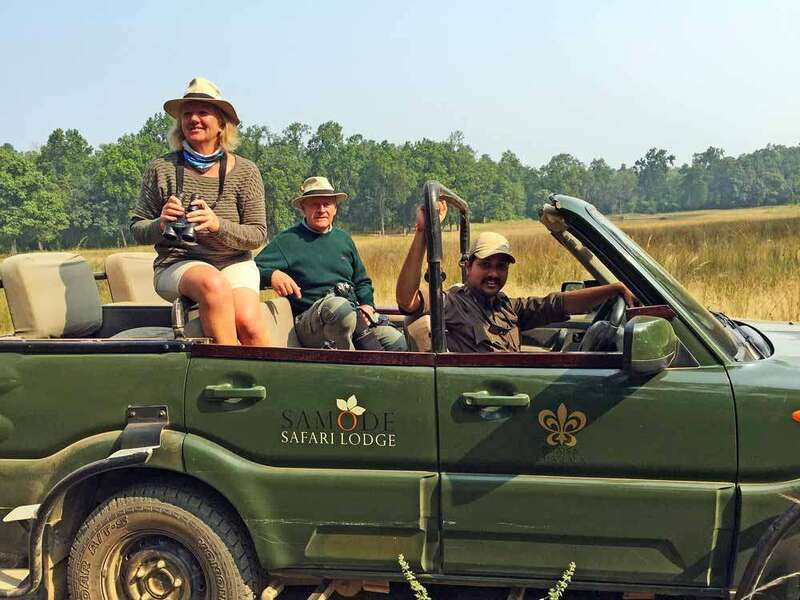 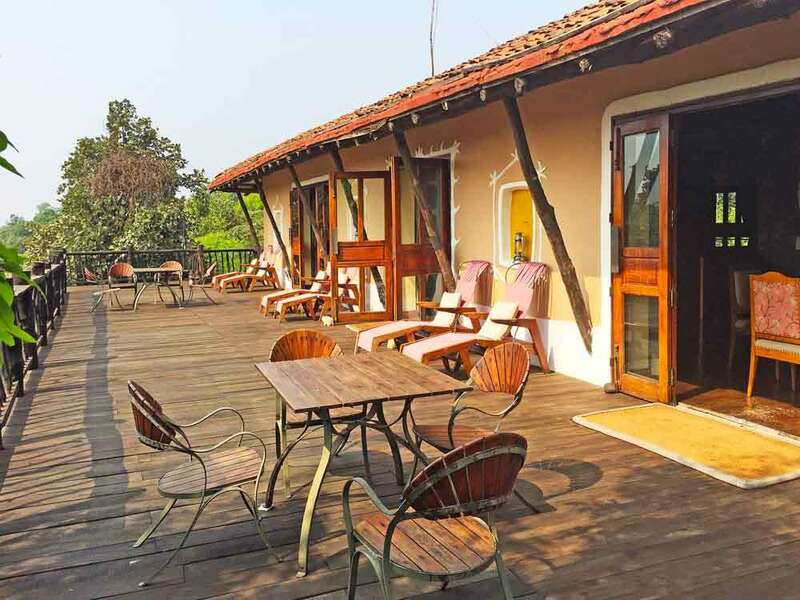 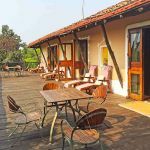 Samode Safari Lodge is well worth the stay – even if, or perhaps because, you have no desire to weather the ever-changing vagaries of Forest Department rules and chase tigers in the adjacent park, when you can chase daydreams in the stylish luxury of this wonderful lodge. 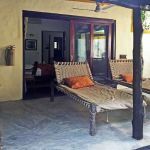 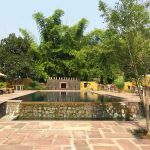 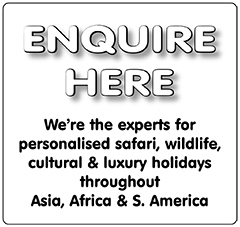 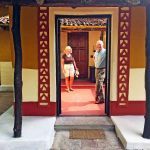 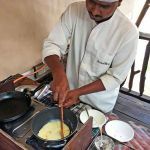 If you simply want more information about wonderful Samode Safari Lodge and Samode’s other heritage properties then follow the link here – or why not ask us to arrange your own tailor-made travel throughout India – see below.